This duvet is the softest I have found by far and I love that its much larger at 103 in.. Its easy zipper snd 4 corner ties makes on off so easy! Protect your comforter and improve the presentation of your bedroom with the beautiful Becky Cameron 3-Piece Duvet Cover Set. Made with the finest microfibers, this classic piece is utterly soft and smooth. Our Duvet Cover provides the highest quality in comfort due its durability, stain repelling feature, and overall long lasting nature. With 15 stunning patterns, this piece is perfect for any style. Included in the 3-piece set are two matching pillow shams (one with twin sizing) along with the duvet cover. Insert not included. 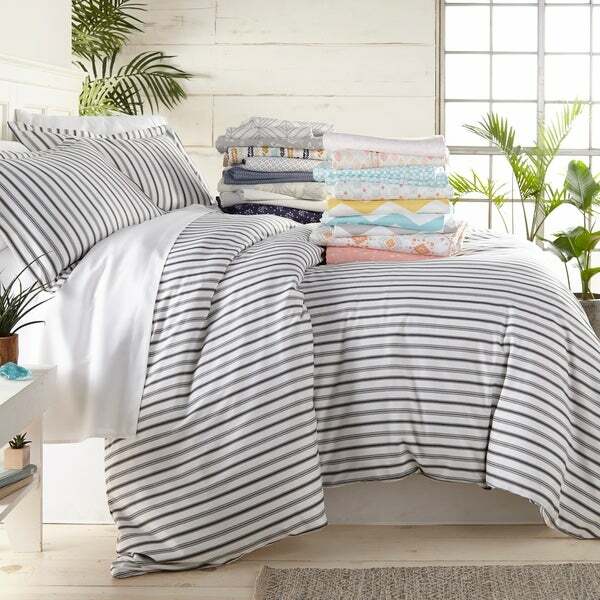 • 1 Twin/Twin Extra Long Duvet Cover: 74" x 94"
• 1 Queen/Full Duvet Cover: 96" x 96"
• 1 King/California King Duvet Cover: 112" x 98"
Dimensions 96.0 In. X 96.0 In. X 1.0 In. This is a really nice duvet cover and pillow case set. They’re super soft to the touch. They also are made very nicely and made with quality fabric. They held up very well in the washer and dryer as well. Will definitely go with any decor as well.Very pleased with quality. I have since bought other linens from them, and intend to do so again. 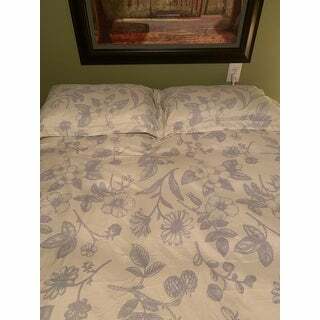 The duvet cover is soft, easy to put on duvet, and washes up nicely. I air dry my linens and sometimes, even though they smell great, they are abit scratchy and stiff, NOT so with the duvet cover, was soft and air dried almost immediately. There was no shrinkage at all, and to test that out, on one of the washings I used the clothes dryer, again, no shrinkage and was soft to the touch. Anyway you clean and dry this, you will be happy with the results. This was my first time purchasing a Duvet Cover Set and I am completely sold! I purchased the Feathers Navy set in king for our master bedroom. The colors are rich but muted and absolutely beautiful. 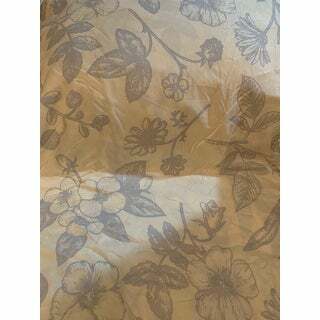 The fabric is extremely soft and lightweight. My husband and I are easily hot at night time, but this hasn't bothered us at all. 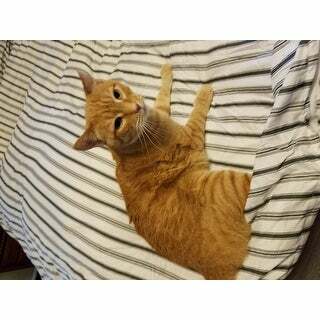 The duvet was easy to slip over my king comfortable. The zipper is very good quality, I don't have any concerns with the zipper wearing down. I have already washed this set twice (hello small kids and dogs) and I've had no issues with it. My niece wants a set for her room now! Loving the lightweight material. The material is also soft. It looks great and the darker tone actually worked well with the other bedding and decor I already have. The zipper slides easily without catching. It pretty much disappears once you get it zipped closed. I have to run my fingers along the edge in order to find it. I have a king-sized duvet insert. This duvet cover has lots of extra space. I am actually quite satisfied with the extra space though. For me it made it a lot easier to get the duvet insert in. It also hangs off the bed more which I happen to like because I have thick mattresses. Because of that, most covers either barely brushes the bottom of the top mattress or doesn't quite cover it all. I am now addicted to Duvet covers. it protects my comforter and able to use my old faded ones. 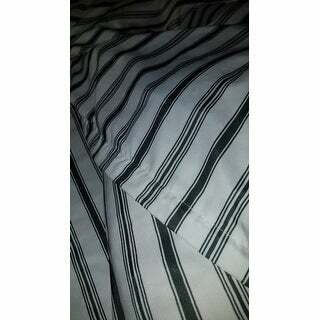 I love the beautiful pattern of this duvet and the fabric is so soft. It firs well with my king size down comforter. I purchased the Aztec Dreams duvet cover with matching pillow cases in king size. The color scheme is amazing. It brings such a nice pop of color to our room. The material is very soft to the touch and lightweight. It washed up very nice without shrinking. I like that it has a zipper instead of buttons or ties. It makes it very convenient to take on and off to wash and I prefer the zipper style. This duvet cover is perfect to hide an old comforter and to brighten up your room on a budget. I love my comforter and use duvet covers alot to change up the look on my bedrooms and to protect my comforter! I am very pleased with this Becky Cameron, It is so soft and lightweight! made with very good quality fabric, very well stitched, so will hold up great for washing. 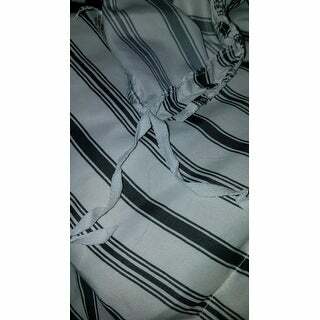 I love the fact that they have ties in the corners that can be tied to my comforter making it nice and easy to slip the duvet on without the comforter bunching and assists in holding it in place! I am very satisfied with my purchase and highly recommend! 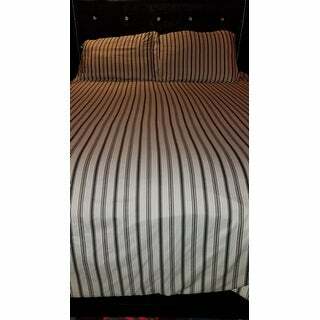 The stripes on this set are very bold and make the bed really stand out. The cover fit my all-season king sized down duvet with lots of room to spare, so it would probably even fit the fluffiest of king comforters. The zipper closure makes it super easy to close without having to fight with buttons and it's so soft that even my cat approves! Very soft, the pattern is understated. 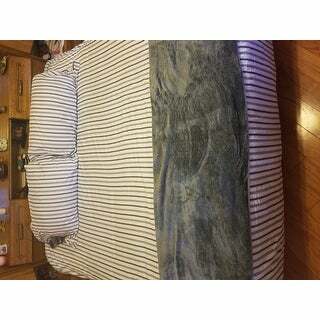 The Cover is pretty large, had a lot of extra room with my standard king duvet. I really like this duvet cover. It is very well made and love the zipper enclosure. It includes ties to keep the inside blanket in place. The stripes look very sophisticated and the material is super soft. I will definitely purchase again! I love the softness of this Duvet set but unfortunately because it is made to fit also a California King, my king blanket is swimming in this with inches of blank space.. Loved this cover. I returned it because the color was not quite what I needed but quality was great for the price. I purchased a Becky Cameron Duvet Cover for my daughter & her husband a couple of years ago & it was really nice. Time to get me a new one!! !